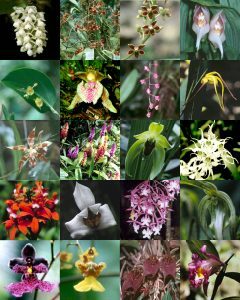 The El Pahuma Orchid Reserve is a 650 hectare (approx. 1,500 acre) protected cloud forest located only one hour from Quito. The reserve is home to over 300 species of orchids, the Spectacled Bear (Tremarctos ornatus), the Plate-billed Mountain Toucan (Andigena laminirostris), and other spectacular montane forest species. The reserve is open for day visitors and also has rooms where volunteers and tourists can spend the night (see Visiting El Pahuma). The establishment of the reserve was Ceiba’s first conservation project in Ecuador. We worked with the landowners, the Lima family, to put in place South America’s first conservation easement. The agreement protects the forest, while providing income to the owners as a destination for ecotourists, birdwatchers, student groups and researchers. The Limas continue to own and manage this beautiful forest, setting an example throughout the region of how conservation can work by keeping lands in local hands. Indeed, many similar operations have sprung up, and now the entire area is a popular weekend destination for Quito families seeking a leafy respite from the city, as well as international tourists longing for their first views of wild orchids and brilliant hummingbirds. The El Pahuma Orchid Reserve directly benefits the conservation of orchids and other cloud forest species via protection of this threatened habitat. Cloud forest is well-known to support an exceptionally diverse biological community that includes numerous endemic species: plants or animals found nowhere else on earth. In fact, due to the varied topography that creates many different micro-climates, Andean cloud forests harbor up to ten times more endemic species than lowland Amazon rainforest! 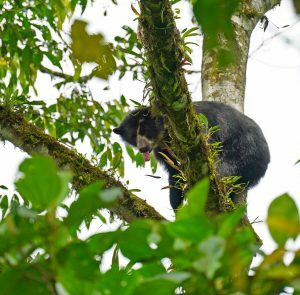 One of the more iconic species that calls the Pahuma reserve home is the Spectacled or Andean Bear (Trimarctos ornatus), a mainly herbivorous mammal named for the markings around its eyes. The bear requires large areas of habitat, and has become an icon for conservation in the region. El Pahuma is a core piece of the Andean Bear Corridor (Corredor del Oso), and effort to join forest owners and farmers together in an effort to protect and connect critical habitat for this threatened animal. For more information on El Pahuma’s biodiversity, visit the Flora and Fauna page! Conservation of the El Pahuma forest also helps protect the livelihoods of farms and communities downstream. A series of beautiful streas and tall waterfalls are found in the reserve, and these drain into the Pichán and Alambí rivers that bound the northern and southern limits of the reserve. Rapid deforestation in northwestern Ecuador is linked not only to critical losses of plant and animal species, but also to steep declines in water quality and flow rates of local rivers. El Pahuma’s forested watershed, cloaked in epiphytes like mosses and orchids, capture rainwater and cloud moisture, steadily delivering it to major regional river systems that reach all the way to the Pacific coast. El Pahuma is now part of a water conservation zone for the Municipal District of Quito. The El Pahuma Orchid Reserve is a 100% locally-managed conservation project. The Ceiba Foundation assisted with start-up and still participates in strategic planning and guidance, as well as occasional financial assistance for maintenance and special projects. The reserve provides the owners of the reserve with a sustainable income that is an ecologically sound alternative to logging or pasture; it also provides an educational destination for many of the regions school children and both Ecuadorian and international university students. In many ways, the El Pahuma catalyzed a local awareness that has spread within the surrounding communities, who increasingly take pride in the strides their region has made towards becoming a top ecotourism destination. Ruth Lima is El Pahuma’s general manager, providing oversight and accounting for the reserve’s daily operation. Her training in reserve management and accounting was organized by Ceiba, and she has proved to be a dedicated and talented administrator. Rene Lima is El Pahuma’s on-site guide. He is extremely knowledgeable about the local bird and orchid species. Rene recently founded the Local Naturalist Guide Association for the region, and is actively involved in the promotion of other sites of interest, both natural and cultural, around El Pahuma.